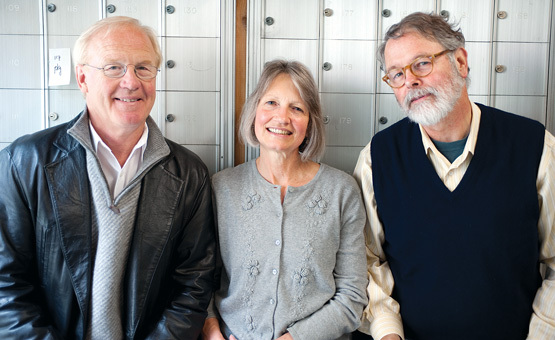 Cleve Larson ’71, Barbara Morrison James ’71 and David Current ’71 collected about 80 letters from classmates for their project. After reading this letter, today’s Whitties wanted to know one thing, said Barbara Morrison James ’71: How did students in the dorms get away with that? In an effort they dubbed the Whitman Letter Project, Current, James and Cleve Larson ’71 collected from alumni nearly 80 letters that give a glimpse into campus life during the late 1960s and early 1970s, when friction between tradition and counterculture made for, well, wilder times. For the project, the three classmates boiled letter excerpts down to a script, which seven student readers presented to alumni at the 2012 spring reunion. To see a video of a reading of the Whitman Letter Project at the Class of 1972’s 40th reunion and to read the script, go to the Whitman Letter Project website. The three classmates got the idea for the project at their 40th reunion in 2011, when G. Thomas Edwards, the William Kirkman professor of history emeritus, lectured on the history of the college in the late ’60s and early ’70s. The answer they came up with was letters. Hard-copy letters were the primary link between students and their parents in this era. The three classmates worked with Associate Director of Alumni Relations Nancy Mitchell to issue a call for letters. Glen Drake ’71 answered that call for submissions in a big way, contributing 26 pages of excerpts from his letters. Have letters? Be a part of the project. James said letters preserve those college days more than 40 years ago in a way that memory can’t. The Whitman Letter Project isn’t over yet. In fact, it may mark the start of a broader effort to collect student correspondence. Current said their goal is to motivate alumni to dig up their old letters and send them for inclusion in the project. “What we’re all hoping is that after seeing the results of our project, people will realize the letters they wrote are valuable,” he said.